The example below illustrates clearly how to find the radius of a circle when the circumference is known. Suppose the circumference of a circle is 50.24 inches, calculate r.
Write down the circumference formula. Replace the circumference with 50.24 inches. Since you are looking for r, you need to get rid of 2 × pi. 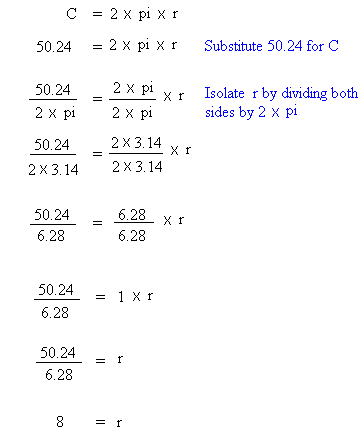 You do this by dividing both sides by 2 × pi. Notice that now the number next to r is just 1 and 1 times r is r. To get the answer, you just have to divide 50.24 inches by 6.28. When the circumference of a circle is 50.24 inches, the radius is 8. The example above illustrates a simple but long way to solve this problem. You can find the radius of a circle very quickly by dividing the value of any circumference by 6.28.
r = 31.4 / 6.28 = 5. Yes, it is that simple yet you still need to know how to do it by following the steps above.